The "Bolshoi Ballet HD Collection" released by the independent Paris-based video label BelAir Classiques, has thus far been exemplary in producing ballet for home video, offering superb quality in all respects. The latest title in the series, Marco Spada, is unfortunately something of a mixed blessing. For one thing this ballet – a contemporary rewrite by French choreographer Pierre Lacotte of a lost 19th-century creation – is a true rarity. Marco Spada, or The Bandit's Daughter set to music from Daniel Auber is a sparkling and colorful evening-length dance divertissement, a jolly romp in a sumptuously traditional setting, danced by a tremendous cast that assembles some of the most exciting dancers gracing the Bolshoi company at the moment. Yet all these goodies come with a price, a technical issue. There is some judder noticeable in the Blu-ray resulting in a slight stutter in movements or panning. (The disc was tried on two different players and TVs with the exact same result, while the problem was also mentioned on internet forums as well.) Nothing that would make the disc unwatchable, but still something that should have been avoided. The plot of Marco Spada about an 18th-century Italian bandit disguising as an aristocrat – a romantic, Byronic hero par excellence – is deliciously complicated and in Lacotte's staging totally secondary to the dance and the purely spectacular. Lacotte doesn't even make much of an attempt to tell the story clearly or to define the main characters in great detail. In his usual fashion he treats us to a relentless cascade of virtuoso steps and stamina-testing combinations in the style of 19th-century romantic ballet, blended with some basic mime and a modern-day presentation. The ballet is not without its longueurs and some bits of monotony, yet in spite of all one will turn and return to Marco Spada in the first place because of the dancers. Very few companies can gather such a wealth of talent as Moscow's Bolshoi Theatre. Marco Spada requires no less than five principal dancers, yet David Hallberg, Evgenia Obraztsova, Olga Smirnova, Semyon Chudin and Igor Tsvirko are in a class of their own – ballet lovers won't fail to notice this is (finally!) the first official home video release featuring Obraztsova, worldwide one of the most admired Russian ballerinas of the last decade. And of course it takes a company like the Bolshoi to impersonate brigands, peasants, nymphs, dragoons, lords and ladies with equal conviction and make dramatic sense of them all. The filming and editing is, as we come to expect from the Vincent Bataillon/François Duplat team, first-rate, but as said there is a small glitch in the mastering. Sonics are excellent in both audio formats with a slight preference for the more subtle DTS-HD Master Audio. Auber's music, adapted from his 1852 opéra-comique of the same name, is delightfully tuneful and uncomplicated, and quite typical of the era. The Bolshoi Orchestra under Alexey Bogorad performs it as if it was the greatest score around. 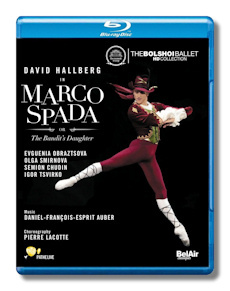 The Blu-ray comes with a 23-minute bonus documentary of choreographer Lacotte talking about the history and the style of his ballet, and principals Hallberg and Obraztsova about the challenges of their roles. A must-see for this unfamiliar ballet. In short, another gem in the "Bolshoi Ballet HD Collection", even if this time less polished than previous ones.